Boy these people are really good at what they do. I’d love to watch them drawing sometime. 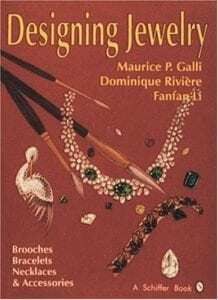 Like their previous work ‘The Art of Jewelry Design’ this book belongs in your collection if you are interesting in drawing jewelry and need some basic design principles and information, especially about commercial conventions in design. It is without any doubt the best illustrated reference available for methods of rendering commercial jewelry and particularly gemstones. The designs are really heavy on the gemstones and the authors truly know their subject. This book also has what seems like more rendered metal surfaces and chains than the previous volume. It is really unsurpassed for its examples of rendered gemstones and stones in settings. Designing suggestions and conventions are discussed in the text. If you have any interest in drawing, rendering, counter sketching or even wanted to use the book as a reference for inspiring design ideas (though I doubt they had that in mind when they wrote the book) you should add it to your library. I’d have to agree with the foreword by AndrÃ© Chervin of Carvin French Ltd that “It answers a deeply felt need – too often unarticulated – for a clear visual demonstration of the techniques used by good solid designers to translate an idea – a feeling – into a meaningful, wearable ornament”. It is 175 pages long (less than the previous volume), 12×9″, tons of full page color pictures of excellent renderings. Major sections include Brooches, Bracelets, Necklaces and Accessories. Each of these large sections is made up to 20 to 30 or more color plate pages and a facing page with text describing and commenting on the content of the color page. It is a lovely coffee table size book with a great binding, a hard cover, creamy slightly glossy smooth paper, a good printing job. Rendering is concerned with speed and the communication of ideas to the client, to oneself and to other goldsmiths. This book does a good job of showing how rendered surfaces and gems are built up in a minimum number of steps, with a reduced palette of colors and techniques for maximum effect relatively rapidly. Rendering systems are about conventions and tricks and there are many shown, some not commented on in the text so that one has to pay attention to glean them all, such as innovative ways of describing the edge of the paper, ever present subtle shadow hints to raise the object visually off the plane of the paper and so on. The transitions from pencil drawing to finished rendering on the same pieces of jewelry which repeats as a theme is particularly interesting. A welcome addition are the occasional technical notes on jewelry construction and pricing consideration hints sprinkled in the text. As with the previous volume I found the format and size such that it was a bit difficult to read, not quite comfortable somehow, the layout seems somehow a little hard to look at. To use it well read it slowly and carefully, looking at the details of how things have been rendered, observing how the images have been built up with the fewest stages possible for maximum visual effect. I have some quarrel with the designs used and have to keep reminding myself the book is intended for a relatively unsophisticated audience in terms of artistic training. They seem very old fashioned to me, I can see examples from the 20’s, 30’s and 40’s which are very similar. Many seem like what we think of as antique rhinestone jewelry designs – but that is because rhinestone jewelry was copying upscale jewelry of its time. It fares much better in its use of repetative patterns, registers, rhythms and formal (arranged geometries). Abstract designs too are pretty good, again based formally in design terms on stone shapes and standard conventions. Almost no design risks are taken. The gap between where the design sense of the book (and perhaps the commercial high end jewelry world) is at and the current contemporary international jewelry design scene is pretty outrageously huge. Get this book, but take the time to widen your views – remember that new designs and modern ways of designing offer the jeweller and jewelry store opportunities for profit as yet untapped. Finally this book is an excellent resource and reference. As with its predecessor I insisted upon my College library obtaining it. Note that Schiffer Publishing offers a free catalog of their books.